June is my big rejection month. I can usually count on a little rejection all the time but by the end of the semester editors and judges seem to want to wrap things up. There’s a boat to catch, or a Yankees home stand, not to mention all the summery commitments. Warner promises to make public his rejections each week in June, because, he notes, “I mean, failure isn’t so bad.” Mistakes are how we learn, often enough; but rejection from a journal is not a mistake (unless the writer has randomly sent a free verse piece to a sonnets-only publication). I often suspect rejection is not a failure, either. Maybe the poem isn’t ready for prime-time; maybe it’s too sentimental or too vague; maybe the writer left in a few clichés. Or not. Maybe the editors already had enough material or just don’t care for poems that feature chickadees or Toyotas. Maybe the editors were just not feeling the words when they read that poem. Maybe the editors have different taste from the writer. Maybe it’s the editor who made the mistake. And remember, there is a gap between these so-called failures during which one might–for example–tend to composing new work or revising older work instead of drowning in one’s sorrows. That’s what I shall be endeavoring to do this month. Wish me luck. I hate droughts. I’m a gardener who lives in a temperate region that, on average, receives about 1,150 mm of precipitation annually (45″). Here we are, in the middle of springtime, blooms on the dogwoods and azaleas, peonies beginning to bust out; and I haven’t heard the welcome noise of rain on the roof for over 5 weeks. Generally, May brings this region 2-4 inches of rain. I miss it, and so do the birds and the deer and the insects and the salamanders and toads…and the few remaining farmers. I water my vegetable garden daily, but I cannot water the whole lawn, the perennial beds, the hedgerows where the larger trees grow. So the grass becomes crisp. And I worry that a strong wind, or a sudden downpour (please?! ), might topple a weak-wooded tree that’s been gasping for nourishment. Drought is also so metaphorical. It signifies lack. A lack of ideas, a creative drying-up, a kind of writer’s block where words harden into obstacles–those things are droughts of a kind that stop thinkers into stasis. If you don’t move, you end up mired. 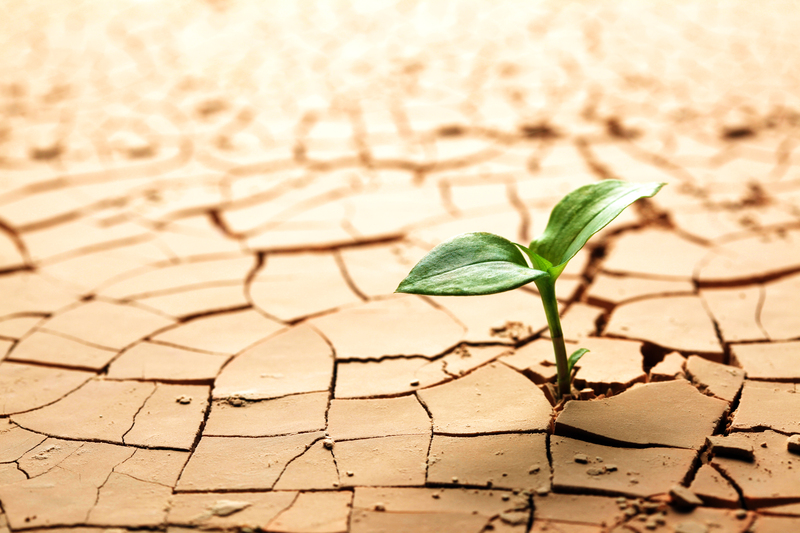 There are several ways to contend with droughts; some require large-scale changes in industry, agriculture, population centers. On the smaller scale, I practice a version of xeriscaping; after years of experimentation, I have learned which plants hold up best under extremes of dry periods or deer depredation. I am alert as to which seedlings are hardiest, which plants can contain themselves in a sort of dormancy until the rain comes. That means I have to let go of my desire to grow certain species and cultivars no matter how envious I am of the way they flourish in someone else’s garden. And it’s the same with a droughty period in my creativity. Certain things I let go of; I work instead with what struggles along in the mud cracks, what creeps under the brickwork or waits for the next real rainfall. There’s often surprising beauty in those hardy emotions and ideas that stay around when the going gets tough, the things that manage to find shade or that–like cacti–prefer a drier clime. Being adaptable is important if one wants to make art, to write poems, to compose. Because life isn’t always going to offer ideal circumstances for the creative or aesthetic effort. I hate droughts not only because they hurt my plantings but because they signal a potential disaster in terms of global climate change, and because thousands of people die for lack of that essential element–water. I recognize, though, that suffering sometimes motivates human beings to make changes, to create new approaches…even to make art. Life is complicated. We evolve through change. I revel in complexity. Yet I seek simplicity. I think not, if one is comfortable with paradox and ambiguity and remains willing to view experiences from various perspectives. Living entities metabolize, grow, die, reproduce, respond, move, have complex organized functional structures, heritable variability, and have lineages which can evolve over generational time, producing new and emergent functional structures that provide increased adaptive fitness in changing environments. Reproduction involves not only the replication of the nucleic acids that carry the genetic information but the epigenetic building of the organism through a sequence of developmental steps. Such reproduction through development occurs within a larger life-cycle of the organism, which includes its senescence and death. Something that is alive has organized, complex structures that carry out these functions as well as sensing and responding to interior states and to the external environment and engaging in movement within that environment. Interior, exterior, replication, variability…a look at computational complexity models shows us that the possibilities are indeed endless. No matter how complicated the specifics become, however, there are these simple phenomena: birth, death; with (usually) some sort of transformation/transition or action occurring in the gaps. While I do not think that most of the questions human beings ask are “simple”–indeed, even the process of asking “do you want cake?” is more complicated at the physiological and cognitive levels than most of us would care to explore–it may be possible to quiet the mind and heart a bit to a level closer to simplicity. The moment of awe offers, to my way of thinking, a kind of simplicity we can access on even the most ordinary days, even as we relish the amazing complexity of the phenomena of the physical world with its fractal tree branchings, its crystalline-structured cloud formations, and the elements in the atmosphere that, through the processing of light (about 4400 angstroms) through the rods and cones of human eyes, make up the quality we call sky blue. Simply beautiful. Breathe in. Breathe out. The beloved life partner of a long-time friend was interred in a green burial today, a glorious May morning full of flowers (she loved gardening…); and I find myself with little to say. It’s been that way for the past two weeks. Not exactly writer’s block, as I have in fact drafted several poems, but an extreme sense of turning-inward. My nature is reflective–I’ve always fallen into the introvert category (INFP for those who are familiar with the Myers-Briggs assessment)–but my job requires pretty constant interaction with other people, students and colleagues for the most part, and quite a bit of listening and talking. I enjoy my job and find it rewarding; but the stressful weeks just before exams, when term papers are due, can be challenging for a person whose inclination is to read books and putter in the dirt. I planted seeds in the earth, and picked flowers. And then placed flowers on a coffin woven of reeds which was lowered into the earth. Returning home the quiet overcame me. I’ve been reading poetry today instead of the Sunday New York Times. Also, I’ve been reading books on “good death” and “mindful dying,” and the guidance of some sensitive and experienced authors seems appropriate and grounded. But grief is hard. It’s probably one reason we invented philosophy, religion, and poetry. 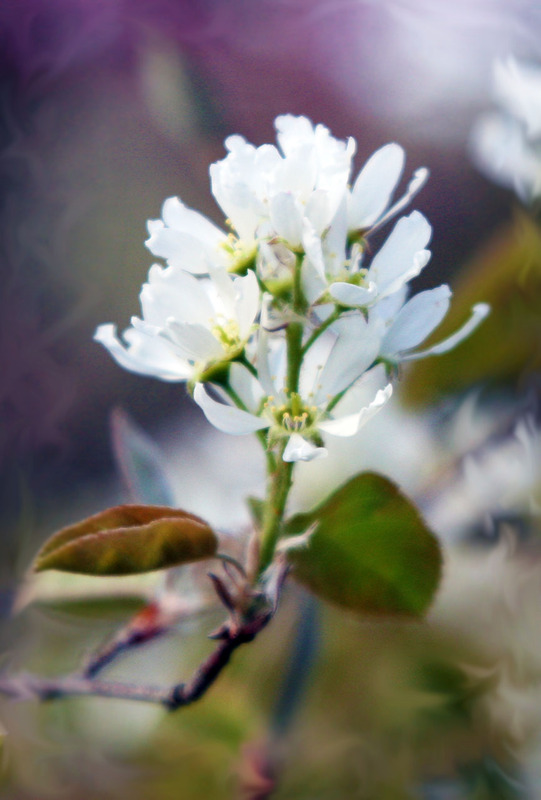 Shadblow, also known as serviceberry. that life is not the life of men. And that is where the joy came in. The joy comes in, somehow, through the quiet and the dirt and the trees.